Oh, how I am glad I got to read this book right now. And even more happy that I re-read The Burning Sky first, as it made me love this book even more when I remembered everything, lol. But sigh. How to talk about The Perilous Sea. I'm not even sure where to begin. It was just so perfect and so heartbreaking. I will not talk that much about the plot in this book. Because it is all so exciting and spoilery and I don't want to spoil anything. So I will just say a few small things. We get to know so much. So much more about Iolanthe. And we get to know more about the Bane. Which makes me shudder. Because he is such an awful villain and I hate all the things that he have done. Yet, you know, it is beyond interesting to read about, which I love. What I want the most in book three is to get to see Atlantis, where he lives. It sounds creepy and awful and I am so excited to read more about it. So fingers crossed for that :D Another thing I love is that we get to read much more about the boys and their school in England. And I loved it so much. They are all adorable to read about. And I cannot wait to know even more. I am excited about all the other characters too. I really love that this book is told from the point of view of Titus and Iolanthe. As I still love them both to pieces. They are amazing to read from and so different yet so alike. Sigh. Another amazing twist about this book is that it is told from two different times. One chapter for each moment in time. Current time in the desert, with a boy and a girl not remembering anything about who they are. And seven weeks behind with Titus and Iolanthe just getting back from summer vacation. It is amazing. I won't say much more than that. As I don't want to spoil anything, hih :D But oh. How I loved this book. I loved that we got to see a little bit more about the Crucible. It is so amazing and creepy and so interesting. But sniffs. The Villa. It breaks my heart a little. Fingers crossed for book three. Anyway. And I loved reading about Titus's mother. So heartbreaking yet interesting. There are more creatures in this book. I loved it. And more magic. And oh. This book is just so different and so perfect. I loved it. I think that what I liked the most in this book was the relationship between Titus and Iolanthe. Though they are going through some tough times. Which broke my heart into a million pieces a lot of the time. And I didn't like that things they did and say. But I also understood it. So well. So despite there not being much romance, there were enough. Because they are perfect together. And there are some really swoony moments in this book. I loved reading them all. Titus and Iolanthe are so adorable. I love them so much. 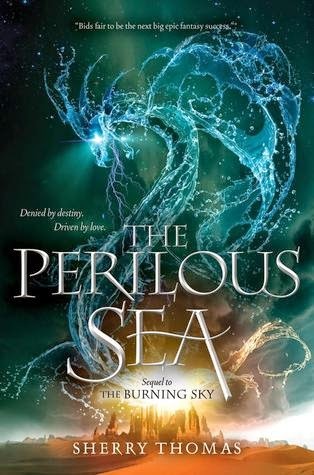 The Perilous Sea is a stunning book. It is full of adventure and swoony moments. It is full of heartbreak and trust. I loved every moment of it. Though. That ending is evil. I wish it hadn't ended at all. I wanted to know so much more. See so much more. But I was also happy. It is a good ending. Pfff, okay, it is a huge cliffhanger. But I can wait. Probably. Though I hate waiting. I just really, really need book three. Waiting will be torture. But I know I will love the next book. And that makes me even more excited. Huge thank you to Balzer + Bray / HarperTeen for the auto-approval on Edelweiss that made me get this book early. <3 I am so happy that I got to read it now; and not wait until September. Ack. I will still be wishing the most for a print ARC of this book, though, as it was so good and I want and need to own all the editions, hih. Also cannot wait to buy my hardcover editions in September. <3 So excited. You all need to read this sequel. Because it is amazing. Some heartbreak, sure, but even more amazing scenes. Cliffhanger and heartbreak!? Damn it! Why the best books always tend to have those?!? I still need to read book one and I think what I'm gonna do is wait till this one comes out and binge read them both! Thanks for the spoiler free review sweetie! The relationship in these sound wonderful! I love the covers as well, and not sure why I haven't read yet. You are very good at writing reviews that are extremely tantalizing and leave me on the edge of my seat! I'm so so happy that you loved this series and that the author managed to create tension without a love triangle. I've always loved Titus, and I cannot wait for more of him. It sounds like you maybe had a slightly harder time connecting with Iolanthe, which is how I felt in the last book. But I cannot wait for more of these two. Though of course you've made me nervous for the heartbreak! I can handle a subtle romance - and I'm excited for those swoony moments. So hope I get time to request an e-ARC before this is published. So glad you really liked it. Oh my gosh, you just got me so excited to read this! I'm sad for hard times for Titus and Iolanthe, but swoony moments? Squee! And I love the sound of the timing of the chapters being back and forth! AH! Great review Carina!! I have this for review and don't want to read much about it so I skimmed your review. I'm SO HAPPY to see you loved it! Yay!